The Extreme Elite Bullet represents the "very best value" in an all-lead hunting and target bullet. It delivers outstanding accuracy with Encore and Omega 209X50 rifles. The 330 and 360 gr saboted bullets are optimum for the 1:28 TC rifling twist. Extreme Elite bullets have a continuous ogive and rebated boat-tail that enhance ballistic performance and put the Extreme Elite HP in a class all it's own. Read more at our Dead Center Page. *Flat Rate Bullets Only Shipping Terms: A USPS promotional FLAT CHARGE of $10 per shipment for bullets only orders. Maximum 15 lbs mix and match per shipment. Out-of-stock and partially out-of-stock orders will be back-ordered, held, and shipped all together in one shipment as soon as we are re-stocked. (Split Ship of partial back orders is available at $10/shipment). 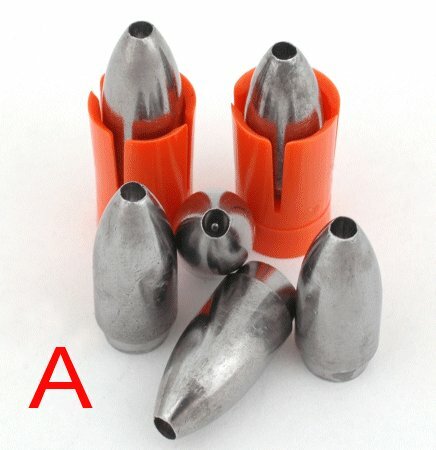 Bullets Only - No loaded ammo or other items - More Info at our Flat Rate Bullets Page. Choose "$10 Bullets Only Shipping" at Checkout.